BirdSlide® is the ultimate solution for all roosting and nesting bird problems. BirdSlide® can effectively deter Pigeons, Swallows, Sparrows, Crows, Seagulls, and virtually all other birds no matter of it's size from landing, roosting or nesting on it's surface after it has been installed. 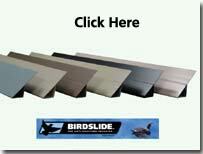 BirdSlide® is designed to be easily adjusted to any corner or ledge. -Ideal for multi-story buildings, parking structures, warehouses, aviation hangars, and homes. View our long list of products and parts! Not sure about a part or installation? This explains and lists everything you need to know. Spring means Swallows and Swallows mean Nests under eaves. 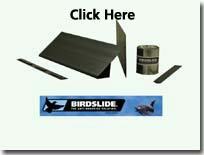 See how BirdSlide® effectively deters Swallows.